Classic Cars for Sale due to retirement - view our classic cars available for sale here. 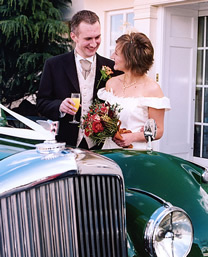 Due to retirement, Ivory Cars is no longer taking any new bookings for wedding cars. We have two of our fleet remaining for sale, if interested please have a look at our Classic Cars For Sale page. If you’re looking for something exceptional to complete your wedding plans, or you want to make an impact for a particular anniversary or special occasion, then Ivory Cars’ fleet of five stunning restored vintage vehicles provide the perfect showpiece. Each vehicle is available for hire and comes complete with a uniformed chauffeur to ensure your wedding or event runs seamlessly, stylishly and to time. Select from our unique 1910-style ‘Pearl Princess’ Tourer, a 1920s-style eight-seater Charabanc, a 1928 Daimler Hooper Tourer or our 1952 Rolls Royce / Bentley Park Ward Convertible ­ one of only six ever built. Each car has its own distinctive individual features including cocktail cabinets, mahogany bottle holders, interior heaters and roll down side-screens. Ivory Cars’ fleet is the only one of its kind in Nottinghamshire and the East Midlands and our eye-catching vehicles have been gracefully transporting passengers around the region for the past 20 years. Each of the five models has been lovingly rebuilt by James Leadley, the owner of Ivory Cars and a skilled craftsman and traditional coachbuilder. James’ passion and knowledge of vintage cars is evident in the intricate detailing and the faithful and sophisticated restoration of each unique vehicle. Ivory Cars are regularly displayed in the Broadmarsh Shopping Centre in Nottingham and frequently attract media attention because of their workmanship, exclusivity and elegant period character. More details are available on each individual car by clicking on the above tabs. If you would like to view any of our vehicles privately then you are welcome to visit our showroom in Colwick, close to Nottingham City Centre. Please call James Leadley on 0115 8712972 to arrange a suitable appointment. Ivory cars magnificent 1952 Bentley and 1910 style tourer have been featured on the B.B.C regional news. The cars were filmed with news presenter Anne Davis at Wollaton Park. The cars were singled out because of their high standards and exclusivity.